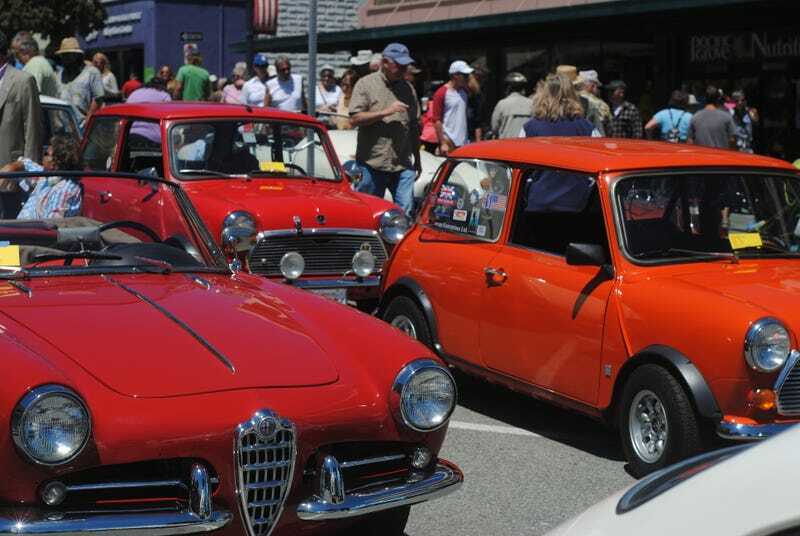 Today I bombed south with my dad to Pacific Grove for the 5th annual Little Car Show, part of Monterey Speed Week. It's exactly what it sounds like, and it's fantastic. Honda Beat! The owner said it was one of six he knew in the U.S. I was surprised how spacious this Mini was. Front + rear seats and a big boot to pack. This dog was so damn cute. I was kneeling down to take a picture earlier and he came and slobbered up my face. Also, there's a Sports 800 back there. There were gobs of other ultra-rare microcars present, too many too list. One of the guys in the show used to be staff at my high school so I was chatting with him (he DD's a Spitfire... over 200k on it). Also one woman noticed my shirt and we starting talking about skateboards—turns out she owned the first ever board by Santa Cruz Skateboards.